In December, stronger US economic data and the decision by the Federal Reserve to begin to taper its massive QE program provided a further boost to equity markets and pushed US bond yields to new 5-year highs. Many strategists remain cautious toward equities based upon over-extended valuations, but expect equities to continue to outperform bonds in 2014. Evidence on US growth continued November’s improvement by surprising on the positive side in December. The November US employment report posted a stronger-than-expected gain of 204,000 payroll jobs, but the unemployment rate edged up to 7.3% from 7.2%. Middle East tensions remained subdued in the wake of the Russia-led agreement committing Syria to destroy its chemical weapons and the US-led tentative agreement with Iran over its nuclear program. Crude oil prices rebounded, as the WTI futures price recovered to $100/bbl at the end of December from its November low of $92. Gold prices continued to weaken, however, as concerns that the Fed would proceed with tapering of QE proved correct and gold fell to $1202 at the end of December, after closing November at $1251. Gold and inflation-linked bonds continued to be the worst performing assets of 2013. Despite the rebound in crude oil prices, the Canadian dollar continued to weaken. The Fed’s decision to proceed with tapering, combined with the Bank of Canada’s more dovish stance on tightening, contributed to weakening the C$, which fell 0.3% against the US$ in December, with USDCAD rising to 1.0641. Stronger US data seems to have been ample justification for the Fed to begin tapering and global equity markets reflected this growth optimism. The S&P500 hit a record closing high of 1848 on December 31. Global equity ETFs posted solid returns again in December led by Eurozone (FEZ), which returned +2.8% in CAD terms, US (SPY) +2.3%, Japan (EWJ) +0.9%. US small caps (IWM) returned 1.9%. Canada (XIU) underperformed, returning 0.9%, despite the rebound in crude oil prices. Emerging Market equities (EEM) performed poorly as the taper began (as they did in the spring), returning -1.0% in CAD terms. Global Bond market ETF returns were mostly negative in December as growth optimism and the Fed’s decision to taper weighed on prices. Canadian bonds (XBB) fell for a second straight month, returning -0.6% in December. US long bonds (TLH) returned -2.1% in USD terms but with the weakening of the C$, the return was -1.8% in CAD terms. Non-US global government bonds (BWX) fared better, posting a return of -0.2% in CAD terms. Emerging Market bonds outperformed in December as USD-denominated bonds (EMB) returned +0.2%, but EM local currency bonds (EMLC) returned -0.5% in CAD terms as EM currencies weakened on the tapering news. Inflation-linked bonds (ILBs) once again were to be avoided in December. Canadian RRBs (XRB) returned -2.2%, US TIPs (TIP) returned -1.2% in CAD terms, and non-US ILBs (WIP) returned -0.5%. US investment grade (LQD) and high yield (HYG) bonds posted meager gains in CAD terms, both returning 0.2% in December. Canadian corporate bonds (XCB) underperformed with a return of -0.5%. The year began with the US fiscal cliff being narrowly avoided as US lawmakers agreed to extend the deadlines for the US Debt Ceiling and government shutdown. As 1Q13 unfolded, it became clear that without a deal, an end to Bush tax cuts for high income earners, an end to the payroll tax cut, and “sequestration” of US government spending would automatically kick in. The Fed, fearing that the fiscal drag entailed by these changes would stall the economy, made it clear that its open ended quantitative easing would remain in place. As the economy fared somewhat better than expected, investment returns got off to a good start in 1Q13. In May, Fed Chairman Bernanke surprised markets by suggesting that the Fed could begin tapering within months, setting off a sharp sell-off in global markets. Bernanke and other FOMC members provided reassurances that tapering was not tightening, but the markets remained unconvinced as growth struggled through mid-year. By early September, the consensus view was that the taper would begin at the September FOMC meeting, but the Fed surprised again by announcing that it would continue to purchase $85 billion of bonds per month. In 4Q13, US economic data showed some improvement and despite inflation running well below the Fed’s desired, the Fed announced that it would reduce its bond purchases to $75 billion in January 2014. In this 2013 environment of sluggish but improving US growth, weak inflation, and large scale Fed bond purchases, global short-term interest rates remained at very low levels, with real rates (after inflation) negative in most developed countries. DM central bank policies, including Abenomics in Japan, represented unprecedented stimulus for a global economy that was in its fourth year of a weak economic recovery. Investors responded to global policy actions, by reaching for higher yields and avoiding near zero cash returns. This meant that money continued to flow into equities and higher yielding corporate bonds. With inflation subdued and the Fed promising to end QE, gold, inflation-linked bonds, and emerging market currencies performed very poorly. The chart below shows annual returns for Global Market ETFs in Canadian dollar terms. 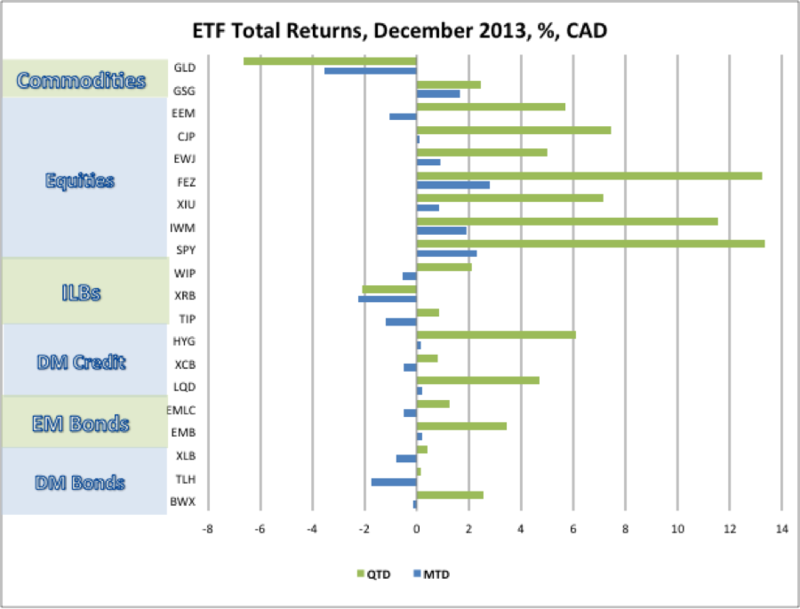 In 2013, the best global ETF returns for Canadian investors were in US and other global equities. The S&P500 rose 26.9% for the year. This resulted in a total return (assuming dividend re-investment) on the S&P500 ETF (SPY) of 32.3% in USD terms and 38.0% in CAD terms. On the same basis, the iShares unhedged Japan equity ETF (EWJ) returned +31.1%, while the hedged iShares Canada ETF (CJP) returned a stunning 55.9%. The SPDR Eurozone equity ETF (FEZ) returned +30.9% in CAD terms. US small caps (IWM) returned 41.7%, outperforming the large cap SPY. 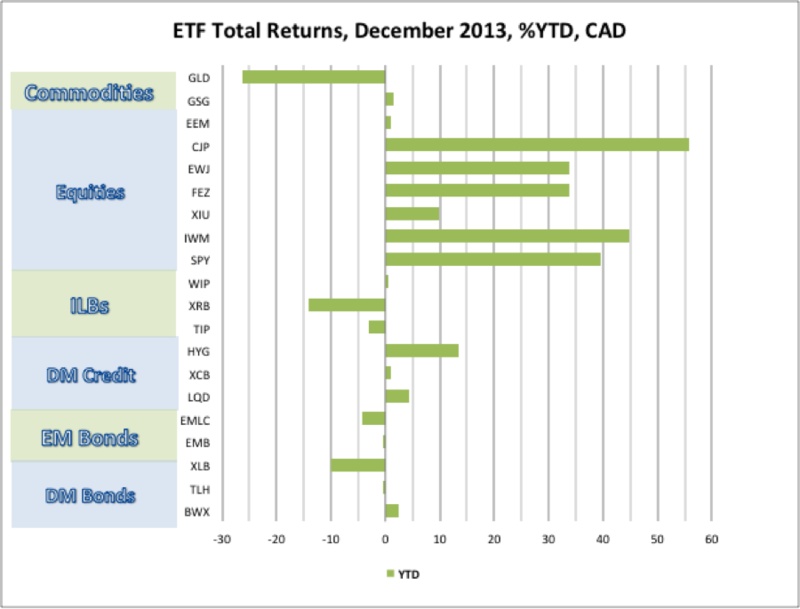 Canada (XIU) lagged these foreign equity ETFs badly returning 9.9% in 2013. Emerging Market equities (EEM) were the weakest as Fed tapering fears led to capital outflows and weaker currencies, resulting in a -1.2% return in CAD terms. Commodity ETFs performed poorly. The Gold ETF (GLD) returned -27.4% in CAD terms, while the iShares GSCI commodity index returned -0.6%. Global Bond market ETF returns were weak but mixed in 2013. Foreign bond ETFs benefited from currency strength relative to the Canadian dollar. As bond yields rose in anticipation of tapering, the DEX Universe Canadian bond ETF (XBB) returned -1.4% in 2013, while the Canada Long Bond ETF (XLB) posted a serious loss of -9.9%. US long bonds (TLH) returned -6.5% in USD terms, but with the weakening of the C$, this translated into a -2.5% return in CAD terms. Non-US global government bonds (BWX) fared better, posting a return of +0.3% in CAD terms. Emerging Market bonds suffered from the same problems as EM equities. USD-denominated EM bonds (EMB) returned -2.6%, while EM local currency bonds (EMLC) returned -6.2%. Inflation-linked bonds (ILBs) were a major casualty of the combination of unexpectedly low inflation and tapering anticipation in 2013. The Canadian real return bond ETF (XRB) was the worst performer, returning -14.1%. US TIPs (TIP) returned -10.0% in USD terms, but thanks to USD strength, lost just 5.1% in CAD terms. Non-US ILBs (WIP) fared better, returning -1.7% in CAD terms. In corporate bond space, the US high yield bond ETF (HYG) posted a solid return of 11.0% in CAD terms in 2013, while the US investment grade bond ETF (LQD) returned 2.3%. The Canadian corporate bonds ETF (XCB) eked out a return of +0.9%. Over the course of 2013, Canadian ETF portfolios more heavily weighted in foreign equities and high yield bonds, with limited or zero weight in commodities and inflation linked bonds performed best. The traditional Canadian 60% Equity ETF/40% Bond ETF Portfolio gained 93bps in December, bringing its YTD return up to 16.1%. A less volatile portfolio, comprised of 45% global equities, 25% government and corporate bonds and 30% cash, returned a very competitive 14.0%. Risk balanced portfolios, which performed well in recent years, were disappointing in 2013. 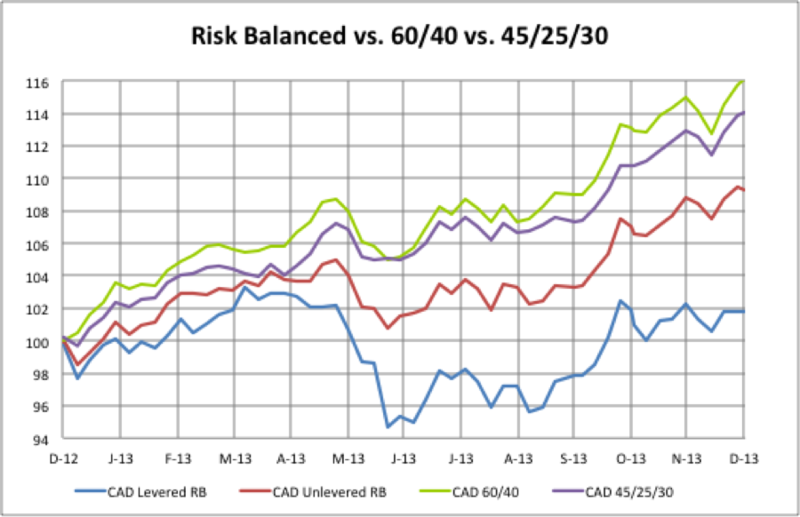 A Levered Global Risk Balanced (RB) Portfolio, which uses leverage to balance the expected risk contribution from the Global Market ETFs discussed above, lost 49bps in December, lowering its YTD return to 1.8%, after it suffered a severe 8.1% drawdown from April 26 to June 21 during the “taper tantrum” selloff. The weak returns in the levered risk balanced portfolio were attributable to the sell-off in the leveraged positions of Canadian nominal and I-L bonds. An Unlevered Global Risk Balanced Portfolio, which has less exposure to government bonds and ILBs and more exposure to corporate credit, returned 43bps in December, raising its YTD return to 9.3%. · Global growth forecasts for 2014 were marked down from July through December. Forecasters are still relatively optimistic that DM economies will grow faster in 2014 than in 2013, while EM economies are expected to slow further in the year ahead. · Over the past month, US economic data have been stronger than expected. 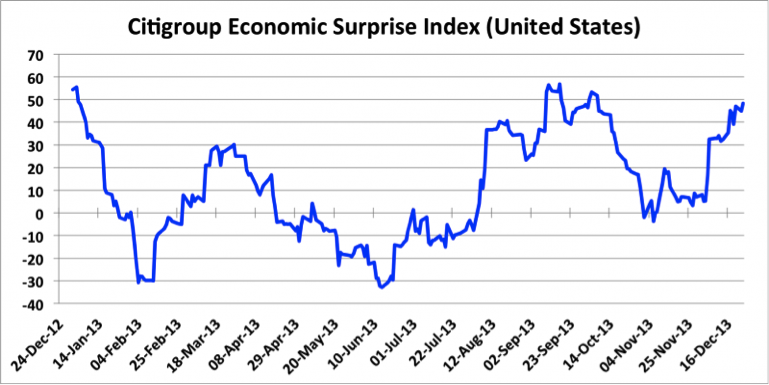 The Citi US Economic Surprise Index rose from -4 in early November to +50 in late December. The US ISM Manufacturing PMI eased down to 57.0 in December from 57.3 in November. While the high level if the ISM indicates a pickup in manufacturing activity in early 2014, it is often better to sell equities at high ISM readings than to buy them. · Globally, inflation fell to the lowest readings since the Financial Crisis in Q413. Consensus forecasts for 2014 inflation are the lowest on record. This means that any uptick in inflation this year will be a negative surprise for financial markets. · DM central banks, which have focused heavily on supporting stronger recoveries and reducing output gaps, are seeing positive signs on this front. While stronger growth may lead markets to believe that the Fed and other central banks will reduce monetary stimulus sooner, if this is combined with an unexpected uptick inflation, the reaction in the bond and equity markets is likely to be quite negative. 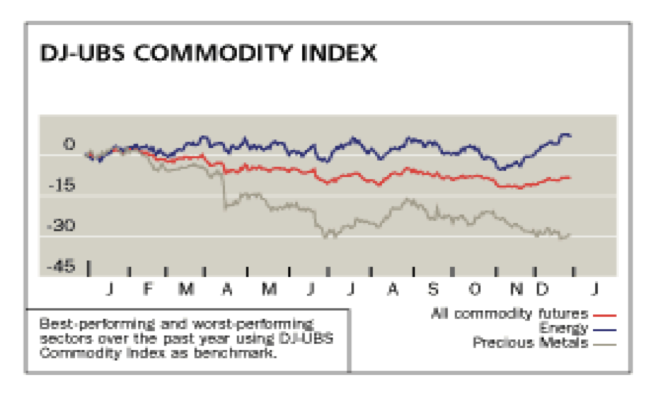 In this environment, we will keep close watch on commodity prices early in 2014. Global excess supply has weighed on oil prices and Fed tapering has been kryptonite to gold. A pickup in growth could see commodities -- the dogs of 2013 -- stage a recovery in early 2014. The market is clearly vulnerable to a 10+% correction over the next few months, but this seems more likely to be a 2014 story than a December 2013 event”. This proved correct. But looking ahead to 2014, equities, credit and government bonds are all richly valued. As the Fed continues to taper, the risk of a sharp equity market correction continues to loom. When such a correction begins, it is likely that it will be triggered by a further sell-off in government bond markets and then spread into the credit and equity markets.